Your child must be 2 years old by 9/1/19. We recommend that parents schedule a tour of our school to receive complete program information, class availability and rate information. 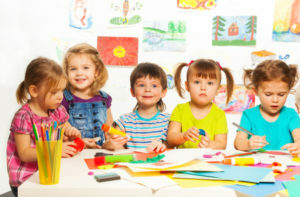 TotSpot Preschool is a PART DAY preschool. Students may be on campus a maximum of 4 hours per day. Extended care hours are available before or after the scheduled class times on a one time or ongoing basis in 1/2 hour increments. Call for extended care availability and rates. A non-refundable registration fee of $150.00 per school year is required at the time of enrollment along with LAST month’s tuition. Tuition will be paid in 10 equal payments. *A 5% sibling discount is available. Hi my name is Becky. I am an Arizona native. My husband and I have been married for 16 years and we have three boys ages 9, 11 and 13. They keep me busy and I enjoy volunteering in their classrooms and teaching Art Masterpiece. I taught at a Fine Arts preschool for many years and also various enrichment classes through city programs. I have experience teaching all ages, but really have a passion for working with the preschoolers. I love watching them learn and grow! Preschoolers hold a special place in my heart and I am so glad to be here at TotSpot working with them! Hi! My name is Jenna Pein. This is my first year at Tot Spot. I am an Arizona native and I graduated from Chandler High School in 2016. I am a mother of two cats and one dog, whom I love very much! I attend Rio Salado Community College and I’m currently working towards a degree in Early Childhood Education. I grew up volunteering every summer at a preschool where I discovered my love for working with children. My favorite part about working with the 3 year old class is seeing their vivid imagination shine through play and through their academics. I enjoy learning from my students just as much as I enjoy teaching them! I am so happy to be a part of the Tot Spot team and being able to work alongside your little ones! I can not wait to see how far they will go. Hi, my name Gabriele Larson and this is my twelfth year in the classroom and my fifth year teaching Pre-K at Totspot! My family moved to Arizona eight years ago from the Philadelphia suburbs, but I grew up in Utah, so I’m happy to be living in the West once more. We have three sons and a daughter, ages 20, 18, 14 & 14. (Yes, twin boys!) Our favorite family activities are traveling, cooking, skiing, reading and camping. I recently completed my Master’s Degree in Early Childhood Education from Arizona State University. Go Sun devils! I received my Bachelor’s Degree in Elementary Education from Brigham Young University and taught elementary school for six years before staying home to be with my children. Teaching is my passion and my joy. I love using children’s literature, music, movement and exploration to bring learning to life. Being with youngsters keeps me young, so thank you for sharing your little ones with me! Hello, my name is Lynette Wheeler and I teach Pre-K at Totspot! I am a native of New Mexico and a recent transplant to Chandler. I have been happily married for 34 years and have two adult children and two adorable grandsons. I graduated from the University of New Mexico with a degree in Elementary Education. I have been a kindergarten teacher for 8 years, second grade for 1 year and assisted in a preschool special education classroom for 3 years. I enjoy working with this age group because the children are so excited to learn! We provide them with lots of fun hands-on activities because this is how young children learn best. Your children are allowed to actively participate in their learning and manipulate material. They are learning the concepts – the hows and whys are being developed. These concepts will allow your children to build on their knowledge, draw from it and apply it to new situations. I want your child to love coming to school and to develop a love for learning and I will do my best to ensure that this happens by creating a classroom atmosphere that helps them develop independence, compassion, fairness, as well as a solid academic base. My Name is Silvia Hartman and this is my third year at Tot Spot. I was born and raised in Southern California. I graduated from BYU with a degree in sociology. After my husband graduated from the University of Utah we moved to Arizona, his home state. We’ve lived all over Arizona and settled in Chandler two years ago. We love it here and hope to never move again. I have four kids ages 15, 14, 12 and 8. I enjoy volunteering in my children’s classrooms and being involved with the PTO. After 12 years of staying home with my kids, after my youngest went to kindergarten, I made the decision to jump back into the working world. I am so happy to be able to do that at Tot Spot and to be a small part of preparing your children for kindergarten. Hi! My name is Mrs. Luciana! Hi. My name is Sue Bergmans. I was born and raised in San Leandro, California. I am married and have two children (twins) and five grandchildren. Since I married, I have lived in five different states, some of them more than once. While living in Boise, Idaho I attended Boise State University. After leaving Idaho I returned to work in the Credit and Finance Industry. Over the next 20 plus years I worked with and trained employees working in Credit Card Centers. My area of expertise was Customer Service. Prior to joining TotSpot, I worked at a Montessori Preschool for eight years working with children between the ages of 11 months and 6 years. I love working and playing with all of the children. I enjoy introducing new things and experiences while watching the children grow and learn. I look forward to getting to know the TotSpot children and parents! Hello, I am Bhumika “Bhumi” Patel. I am so happy and excited to be teaching at TotSpot! I was born and brought up in India. I have been living in AZ for 6 years with my husband and two awesome kids. I have experience working with toddlers and preschoolers for over six years and have enjoyed creating fun and interactive activities. I have a credential in Human Development and a Diploma in Computer Applications. Currently, I am working on my CDA certification and am in my last year of completing my degree in Early Elementary Education. When I am not teaching, I have a passion for cooking, crafting, reading, gardening and in particular, I enjoy going out with my family & friends and spending time with them. The most amazing part of being a teacher for me is to see or hear one of my students apply the skills that they have been taught and see the excitement on their face. Hi! My name is Noelle Miller. I am an Arizona native. I have grown up in the Chandler-Gilbert area. I have worked with children in the dental field for 6 years and through my church for 10 years. I have mostly been a stay at home mom for 18 years with my 5 children. My oldest child is now 20 and my youngest child is 7. I love music, cooking, baking, decorating and spending time with my family. Now that all of my children are in school, I am so excited to join the TotSpot family! I love children so I get to have the best of both worlds. I believe that every child can succeed and should feel happy and secure. Preschool is such an important step for that; where they can learn and grow and gain the confidence they need. I can’t wait to be a part of helping children have a love for learning! Hi! My name is Jennifer Keenan and I am so grateful to be joining the TotSpot family this year. I am a New Jersey native, who has called Arizona home for the last 12 years. Prior to moving, I earned my BA in Special Education from Georgian Court University. In AZ, I briefly taught both elementary and high school resource classes before deciding to pursue a career in healthcare. I received my AOS in Respiratory Therapy and my Certified Respiratory Therapy license. While earning my degree, I worked caring and nurturing infants through Pre-K students in a daycare setting. For the last 9 years, I’ve worked as a RT, but now I have the opportunity to come back to teaching, something I’ve always loved. My wonderful husband, Patrick and I, along with our two energetic boys, Brennan (7) and Mason, (4) live in Chandler with our 3 cats. My oldest son is in 2nd grade and my little one is attending Preschool here at TotSpot. As a family, we love to watch football and enjoy going to Diamondback games. I also enjoy coffee, reading, photography and any alone time I can get at Target! ; ) I am excited to have the opportunity of working with your little one in the 2’s class, helping them learn and grow during this new adventure. My name is Theresa Heckert and I am excited to be part of the TotSpot Preschool staff. My husband, son and I moved to AZ from Wisconsin and we are loving the warm weather here. We also have a granddaughter who we enjoy spending time with! For 12 years I was a stay at home Mom, and when our youngest entered 1st grade I began working at a private preschool in Green Bay as an assistant in their 3 year old room . I was an assistant for 8 years and then for 4 years I was a head teacher. Many moons ago, I earned my AA as a Legal Secretary, but I actually found my passion in Early Childhood after I was hired to teach the 3s & 4s classes at a local private school in Green Bay, WI. In addition to my 12 years of experience in teaching preschool, I have also been working toward my Bachelor’s degree in Interdisciplinary studies with a minor in Human development. I am very excited to be working with your children and getting to know all the parents over the course of the school year. I love to watch how the children develop over the course of the school year and see their love of learning grow. Hi! My name is Mrs. Amy and I feel privileged to join the great staff at TotSpot Preschool. I am a 4th generation Arizona native (a true desert rat!) and I love this great state. I graduated from Arizona State University in Graphic Information Technology and worked at ASU for five years. My husband and I currently live in Chandler with our four children ages 13, 11, 9 and 5. After staying home for 13 years with my kids, my baby went to Kindergarten this year. I have taught preschool co-op over the years with my own children and I am very excited to help teach your little ones this year. I especially love that children stop to smell the roses and appreciate the wonder of our world! Hello. My name is Audra Pettit and I was born and raised in Tempe, Arizona. I live in Chandler with my wonderful husband and four kids. In my spare time I love to read, work in our garden, and plan our next family camping trip. I enjoyed staying home with my children for 13 years. During this time I have worked with young children and youth through my church, provided child care in my home at various times, and enjoyed working with different moms over the years doing play group and preschool co-ops together. I have a Master’s Degree in Social Work from Arizona State University. A highlight of my education was a year-long internship as an elementary school counselor in Gilbert helping children navigate some of life’s challenging experiences. Here I gained a deep appreciation of the importance of play in a young child’s academic, social, and emotional education. Prior to joining the TotSpot team, I enjoyed working as an Assistant Teacher at my daughter’s preschool in Queen Creek. I look forward to continuing to work with energetic young learners here at Totspot. Hello! My name is Ms. Debbie and this is my 6th year at TotSpot Preschool. I love working at TotSpot! It is so fun and I am thrilled to meet all of the students that come here every year. I have had the privilege of being in all age groups at TotSpot and I enjoy working with all the different classes. I love watching the excitement in a child’s eyes when they learn something new for the first time. I very often feel that these sweet children are always reminding me of how fun it is to be a child and their “full of life” personalities are so enjoyable to observe while interacting with others. I am very lucky that I get to come and “play” everyday at TotSpot! I am an AZ native and I grew up in Chandler so this area is home to me and I love it here! I have 3 children ranging in ages from 18-13. In March of 2014, I earned my Academic Certificate in Child and Family Professional Development (Pre-school) from Rio Salado College. I enjoy spending time with my family and watching movies, when I have the time. I look forward to another great year at TotSpot and I look forward to meeting all of our new students soon!! My name is Angie Critchfield and I’m looking forward to having you in my preschool class this year! To help you get to know me a little better, here are some things about me! I’m married and have 5 children. My oldest daughter, Madeline (19) is leaving in November to live in Denmark. Next, I have daughters Hannah (17) and Chloe (15) that are in high school, Abigail (10) is in 5th grade, and my only son, Burke (4) will be a student at TotSpot this year. Some things I enjoy doing are going to the movies with my husband & kids, playing games, cooking, doing crafts, and traveling. My family goes camping on the beach 1-2 times a year and we love it! I love music! I enjoy playing the piano and listening to my daughters sing, play their violins and the string bass. My favorite color is red and I love Diet Dr Pepper! Around town, you might find me shopping at Target or Costco, or out to eat at Café Rio or getting a soda at Circle K. My favorite treats are chocolate, yummy breads or almost anything lemon flavored! I’m new to TotSpot this year and am super excited about teaching your child and watching them grow. They will not only learn through fun, hands on activities academically, but also important things socially like making friends, taking turns and expressing themselves. Hello! I am Nicole Cameron and I’m very excited to be teaching at TotSpot! I am a native of Arizona, growing up mostly in Chandler and Ahwatukee. My husband and I are proud parents of 4 sons, ages 12, 9, 6 and 3 years old! One of my favorite hobbies is cheering them on in basketball, soccer and baseball! I received my Bachelor’s Degree in Elementary Education from Arizona State University and I earned a Master’s Degree in Early Childhood Education from Northern Arizona University. I chose to take a break from teaching kindergarten to spend more dedicated time with my sons, in their younger years, but I always found ways to work in education as a substitute teacher and as a reading tutor in after-school programs. I absolutely love to work with young children, especially preschoolers! Preschool is such an exciting time to learn through hands-on activities, music, play and more! I am very happy to join the TotSpot team and look forward to a great year together! Hello! My name is Jennifer Fowler and I’m excited to be joining the TotSpot family teaching 3 year olds! I grew up in Loveland, Colorado. I have my bachelor’s degree in English and Elementary Education from Colorado Mesa University. I moved to Arizona 17 years ago for my first teaching job and taught grades 3-5 for seven years. Today, I live in Chandler with my husband and our three children. My daughter attends TotSpot too! I love to read, decorate, attend our son’s sporting events and spend time with my family. I also enjoy volunteering at the elementary school and serving in children’s ministry. I’m looking forward to instilling a love for learning in your child’s early education years. Hi! I am Megan Wiley and I am so excited to be teaching at TotSpot! We just moved to Chandler, AZ from Williamsburg, VA. My husband is active duty military and we have lived all around the United States. We have two boys, Sean and Jackson, whom fill our lives with love, laughter, soccer and lacrosse! I also have two puppies that you’ll find me snuggling with in my free time. I graduated from George Mason University in Fairfax, VA with a degree in Early Childhood Psychology. I have been working in early childhood education for eight years and I have taught both three’s and Pre-K! I am coming from a preschool where I was NAEYC certified as well as trained in Conscious Discipline. I feel truly blessed to be a preschool teacher and to be able to share my days with your children. I want them to feel loved, feel safe, and to enjoy coming to school! I will provide a classroom that encourages independence, creative thinking, compassion, and hands-on fun! I look forward to working with the children, parents and the incredible team of teachers at TotSpot to make this a great year! At the time of enrollment, an enrollment fee in the amount of $150.00 is charged and an amount equal to ONE MONTH tuition. The $150.00 enrollment fee is non-refundable. The one month tuition is non-refundable after July 1st. If you need to dis-enroll your child for any reason during the school year, you must submit a 30-day written notice to the front office and the one month tuition that was paid at the time of enrollment will be applied for the last 30 days your child attends TotSpot. TotSpot Preschool charges a yearly tuition. The tuition is divided into 10 equal payments (Aug. – May) and is due on the 1st day of every month. TotSpot Preschool follows the Chandler Unified School District calendar for breaks and holidays. I understand that the monthly tuition will remain the same each month regardless of breaks, holidays, illnesses, field trips, parent teacher conferences or personal vacations & there are no makeup days. Hi! I’m Karen, and I’m excited to join the TotSpot teaching team! I am originally from Massachusetts, and before settling in Arizona in 2005, my husband Eric and I lived in Germany for 7 years. Our sons – Dan (25) and Jonathan (22) were born in Munich but we returned home to MA when they were ready for kindergarten and preschool. Although I studied Business in college and have a degree in Accounting, it was only when I began raising my own children that my true path was revealed. For the past 17 years I have loved teaching children ages 2 through 5, and even learned from them! This “work” has been my greatest joy. There isn’t anything more rewarding than being a part of the development of young children. This year at TotSpot I look forward to getting to know the children and families of the MWF 3’s class in Chandler and sharing many fun learning experiences with them. My name is Kristine Brown and I am proud to be joining the TotSpot family. I have four wonderful children, ranging in age from 13 to 23, and two precious grandchildren. I am originally from Southern California, which is where I met my husband. After a couple of moves, my family and I settled in Chandler 12 years ago. We love it and have found it a great place to raise our children. I have enjoyed being involved in my children’s schools throughout the years. Three of my children attended parent co-op preschools in which the parents shared responsibilities and worked in the classroom on a regular basis. I served on the board of the preschool as well as co-president of the PTO at our elementary school. I thoroughly enjoy working with children and look forward to getting to know the youngest of our TotSpot students! Hello, my name is Roberta and I was born and raised in Brazil. I’m a bilingual and completed Vocational High School focused on Early Childhood Education in the State of Minas Gerais, Brazil. My family moved to the U.S. and I lived in Massachusetts for over 10 years. Due to my husband’s job relocation, we moved to the beautiful state of Arizona in 2011. I’ve been married 16 years and have two beautiful and healthy Daughters. For many years, I worked at Intel Corporation as an administrator where I acquired the skills to perform well and excel in a fast pace work environment. In Arizona, I worked as a Paraprofessional Educator within the Gilbert District. We as family, love to travel and have visited over 15 countries exploring new cultures, cuisine and educate myself on other languages. I love sports, especially soccer where I was heavily involved in my early childhood. I’m a New England Patriots fan but also support Arizona teams. Love hiking and spend time photographing people, nature and animals as my favorite hobby. I’m currently pursuing and enhancing my education in Early Childhood and look forward to working as an Assistant here at TotSport Preschool. I feel honored and blessed to have joined this amazing team of Educators. Hi! My name is Heidi Sanchez and I’m so excited to be teaching at Totspot! I am originally from Yuma, AZ but at a young age moved to Las Cruces, NM where I was raised. I moved back to AZ two years ago and am glad to be home! I graduated from NMSU with a Bachelors degree in Early Childhood Education. I taught kindergarten for 5 years at Los Lunas Public Schools before I decided to stay at home when my second child was born. Since, I have been very fortunate to be a stay at home mom and have enjoyed every minute of it. I have missed being in the classroom and feel like Totspot is the perfect place to get back in my groove again. I especially love preschoolers and am amazed by their curiosity and excitement to learn. When I’m not teaching, I enjoy being a mom and wife. I also enjoy staying active and running when it is cool outside. I am so excited to embark on this journey with you and your little ones! My family and I recently moved to Gilbert. We are excited to put down roots here and become true Arizonians! We are a military family and have lived all over the country and even two years in Japan. My husband has been in the Navy for 28 years and is completing his last tour teaching as ASU. We have three amazing children ages 15, 12 and 9. I enjoy camping, working out, reading, country music and playing with my dog Duke. I have been in Early Childhood Education for over 20 years. I graduated from University of San Francisco with a BA in Psychology. With our many military moves I tried different jobs but always returned to teaching. So in 2005 I decided to return to school when my children were young and graduated from the University of Phoenix with my Masters in Early Childhood Education. I returned to the workforce when my daughter turned three and knew this was my passion and what I was meant to do with my life. My favorite part of teaching is getting to work with young children everyday. I love watching them grow, develop and gain confidence in their abilities. I strive to make my classroom a place where your children feel part of community, gain independence, be creative and have FUN! Hi, my name is Annette Weidenbach and I feel so blessed to have the opportunity to share my love for teaching at TotSpot Preschool. I’m originally from Brooklyn, NY and left in 1992 to attend Northern Arizona University. I graduated from NAU in 1994 with a Bachelor’s degree in Elementary Education and married my college sweetheart 2 months later. We just celebrated our 20th wedding anniversary in Feb. and have 3 wonderful daughters together. In 1996 I received my first opportunity to introduce education in a fun, exciting way to a classroom of 4th graders. I continued teaching for the next 7 years in Mesa Public Schools and experienced grades 4th, 1st and 3rd (student teaching in Kindergarten). I decided to take a break from teaching when I was expecting my 2nd daughter. I wanted my children to have beautiful memories of me being home with them and I didn’t want to miss out on being a full-time Mom. As time went on I discovered a way to fulfill my passion of teaching and also enjoy the experiences of being home with my children. I started a preschool from my home and was blessed to see 50 children pass through my home in the 6 years of teaching preschool. If I’m not teaching children the next best place to look is the kitchen, as I love to cook. Did I mention I’m 100% Italian? We do 2 things very well… cooking and eating and I managed to bring that into the classroom as well. I look forward to the wonderful journey your child and I will have as we prepare for Kindergarten. My name is Sara Wheeler. I was born in Albuquerque, New Mexico where I lived for 22 years. I graduated from the University of New Mexico where I earned my degree in Elementary Education. After graduation, I moved to Chandler to start a new adventure and be closer to family. I am excited to explore Arizona and start a new chapter in my life! I am so happy to be joining TotSpot Preschool. It has always been a joy being around young children and helping them grow. I am eager to share my love for teaching with your child and excited that I am given the opportunity to be a part of their education. Hello, my name is Connie Capron. I was born in Erie, Pennsylvania yet, Arizona is where my heart is at home. I have lived here since I was 10 and just recently moved back to “the valley” from the White Mountains. On 7.17.17 I married my best friend and better half in Jamaica. I am a mom to four wonderful kids (3 boys and 1 girl), a very proud Navy mom, a mother in law and have added 3 bonus daughters along with their family members. I am truly blessed to also add the title “Memaw” to my resume as my first grandchild was born in 2015. Family is extremely important to me and has taught me many lessons throughout my life. For the past 26+ years my biggest accomplishments have been raising my children. With my oldest being born blind, autistic and mentally challenged, he has taught me more in life than I think I could ever teach him. I have experience in working with many children and adults with learning and physical disabilities. I am currently enrolled in College for the first time in my life! I am working on a degree in AAS Early Learning and Development. During any “free” time I may have, you could find me creating art, scrapbooking, catching up on the Braves, with my husband finding an adventure in the great outdoors, traveling, antiquing or down time with my growing family. I’m extremely excited to be an assistant teacher here at TotSpot Preschool. I can’t wait to jump in full speed to enrich your children’s lives while they continue to teach me about life. Hi! My name is Gillian McGill. I was born and raised in Edinburgh, Scotland. It was there I earned my SVQ 2 and HNC in Childcare and Education (the equivalent of a bit more than an associate’s degree in the states) in 1997. I also went back to school to study Midwifery in 2002. My husband and I moved to Arizona in 2007 due to my husband being relocated with work. Prior to moving here we spent some time in Portland, Oregon and Dublin, Ireland. Throughout the years I have had the pleasure of working with children in various childcare settings and am very much looking forward to getting back to teaching after taking some time out to look after my own 2 beautiful children. I absolutely love working with children and am very excited to be part of TotSpot Preschool. My name is Penny Meskill. I graduated from ASU with a degree in elementary education and early childhood education. For 15 years I operated a private preschool and in 1994 I was hired by the Chandler Unified School District. I am currently teaching kindergarten at Navarette elementary. The summer of 2011 I was hired to join the staff at TotSpot Preschool. I teach summer and intersession camps in the 3-6 year old classroom. I love teaching young children and I never tire of the joy I get from helping them grow and develop! They truly keep me young at heart! Hi my name is Lisa O’Neill. I currently live in Chandler, but grew up in Chicago, IL. I graduated from Illinois State University with a Bachelor of Sciences degree in Merchandising. Before settling down in Arizona, I also lived in Seattle and San Diego. California is where I met my wonderful husband, who at the time flew helicopters for the Marines. For the last 7 years I have been a stay at home mom taking care of my two incredible children. My children would probably describe me as the silly mom who loves to dance! My daughter attended preschool at TotSpot and we ALL just loved the amazing teachers and positive atmosphere at this school. I frequently volunteer at my children’s school to help out the classroom. I really enjoy spending time with children, I am always amazed at their imagination and creativity. It’s hard not to be overjoyed when you see a simple smile on a child’s face. I feel blessed to be able to join such a terrific team at TotSpot Preschool, and I am looking forward to meeting all the parents and children this year! Hi my name is Ms. Nelay and I am excited to start our year off on this wonderful journey of learning and exploring new activities together! I enjoyed teaching the 3’s for the last two years and I look forward to teaching pre-K this coming year! I have been a member of the TotSpot family for five years. I have taught for the Mesa Public Schools as an Elementary School Teacher for six years. I am an Arizona native, grew up in Mesa, and attended Northern Arizona University. I graduated from NAU in 2000 with a Degree in Elementary Education. During my first year of teaching I met my husband, Nathan. We are celebrating fifteen years of marriage this July. We have three beautiful daughters: twins Ashlynn & Amara-12 and our baby girl Bryssa-9. Our family LOVES to watch cooking shows and cook all together in our home kitchen. Some of my hobbies are baking cupcakes, hiking Arizona, and taking beach vacations. One of the many ways I build a connection with your child is to bring in my love for baking/cooking into our preschool classroom throughout the year. Enjoy the rest of your summer break and I will see you soon! My name is Suzi Janda and I love teaching at Totspot! I am from Spokane, WA and migrated down to the Arizona sunshine 14 years ago to be closer to my husband’s family and cousins for my kids to enjoy. I graduated from Brigham Young University with a teaching degree in Special Education and taught for 2 1/2 years before staying home with my boys. It’s hard to believe my youngest is starting kindergarten this year! As a stay at home mom, I have had a lot of fun over the years with playgroup and preschool swaps in my home. I have taught piano lessons for 17 years and spent many hours leading cub scouts in their fun adventures! In my free time, when I’m not feeding growing boys or watching their sporting events, I love to read. My family loves spending time together boating, hiking and being together. I’m so happy to be part of TotSpot! I enjoy teaching children and love to see their excitement as they learn new things and discover how our world works. Hi, my name is Laree Fuller. I am an Arizona Native. I attended ASU and graduated in May 1992 with a Bachelor’s Degree in Speech and Hearing Science. During that time I spent 1 year at ASU studying Elementary Education. I have lived in the Chandler-Gilbert area for the last 15 years. I have 4 children with the oldest being 12 and the youngest being 5 and just finishing kindergarten. My youngest attended TotSpot Preschool during the 2010-2011 school year. I am very excited to be teaching at TotSpot! I love working with the kids and thoroughly enjoy coming to work every day! My favorite thing about teaching is seeing the joy in a child’s eye when they have accomplished something they did not think they could do and that moment is priceless. I love all the kids so much! I love adventure in everything and teaching is a great adventure to me. The kids and the personnel at TotSpot help me come to “play” every day. My name is Ms. Brooklyn. I recently graduated from ASU with a Bachelor of Arts in Elementary Education. I have been with TotSpot through my college years working as a substitute and at the camps. My time at TotSpot has taught me that being a great teacher is more than my degree, it is loving the children and feeling the exhilaration as I witness the incredible growth that happens in the early years of a child’s life. I love seeing the excitement in their eyes as they learn and the sweet friendships they develop with their classmates. I am the oldest of three children. I’m from a small town called Show Low. I look forward to the opportunity to get to know my students and their families and to a great year! My name is Esmeralda Pena. I joined the TotSpot family in 2014. My husband owns an auto body shop in Mesa and together we enjoy spending our free time with our son and our extended family. We also love to camp and travel. I have really enjoyed the opportunity to work as an assistant with such amazing teachers. The students are so adorable and keep me entertained! After spending the last two years at TotSpot, I have found my passion in Early Childhood. In High School I received my Certificate in Early Childhood, but I have now decided to go to college to obtain my degree in Early Childhood. I am grateful to learn and grow from working with the students at TotSpot and take the skills I have learned home to my son. I look forward to one day completing my courses and becoming a teacher. Hi my name is Gretchen Peterson. I grew up here in Tempe, Arizona. I earned my Associates Degree in Early Childhood Development from UVSC. I have also studied French and recently went back to school to study British and European History. Prior to joining TotSpot, I loved being home with my three children. I have enjoyed working with young children again and using my education more formally. Young children are so much fun to work with! They are so loving and eager to learn. You can see the excitement in their eyes as they learn new things and make sense of this incredible world we live in. My name is Teressa (Tess) Dulle and I would also like to tell you a little about myself! I am originally from New Jersey and moved to Arizona about 15 years ago. My husband Bobby and I have 2 amazing little boys named Landon and Hudson & a NEW baby girl Elena. I received a bachelor’s degree in Early Childhood Education from Arizona State University and I am continuing my education every day! I taught for many years in the Gilbert Public Schools and then at TotSpot. I now work closely with all the TotSpot Head Teachers over seeing the classrooms and curriculum. It is my goal, together with Shannon, to make sure that we have the best program available for our students and that our teachers are well trained and confident as they provide a top notch quality education. My name is Madison Greer. I joined TotSpot Preschool at the end of the 2012-2013 school year as a substitute teacher and now I am excited for a new school year to begin! I have lived in Queen Creek for the past 3 years, but my family and I have lived in several other states. I am a student at Chandler Gilbert Community College and I hope to eventually be a Diabetic Educator. I am the 2nd of 4 children and I am the only girl. I have really loved working with the children at TotSpot every day. My favorite thing is watching the children learn new things. I look forward to this upcoming year. My name is Myrna Malimban. I am a mother of four children, all whom I home-schooled. I have a Bachelor of Science degree in Economics from the University of the Philippines, and a Master’s degree in Business Administration from The George Washington University. I worked for several years in the field of finance as a loan specialist, but chose to leave the corporate sector to care for our first child full-time. I then went on to home-school all my children in all subjects until the oldest started high school. My two oldest children are now pursuing their undergraduate degrees at Brown University. I discovered my passion for teaching through our home-schooling experience. Since then, I have taught children ranging in ages from pre-school to middle-school. My teaching experience has been in various small settings: Home-school, cooperatives, churches and pre-schools. It is such a delight to work with the children at TotSpot! I enjoy helping the children develop a sense of wonder and a love for learning. My name is Shania Pablo. I graduated from Vista Grande High School and I am currently attending Central Arizona College. I am majoring in Early Childhood Education. I enjoy working with toddlers. Seeing their creative minds and discovering how much they can learn at such a young age is remarkable. One of my favorite things to participate in with the children is the process art. I love to see their creations! I was introduced to TotSpot through my required volunteer hours for my Early Childhood Program and was thrilled to be asked to join the team as a Pre-K Assistant. I am so grateful for the opportunity to learn hands on in such a strong preschool program as TotSpot. I am excited to join the TotSpot family as an Assistant Teacher. I have worked with TotSpot for several years as a Summer Camp Teacher before I left to serve a mission for my church. I am one of 6 SIX sisters in my family and most of which (mom included) have taught at TotSpot. Many of you are familiar with my big sister Emmalee who is also an Assistant Teacher on the Pre-K team. I have really enjoyed getting to know each one of my students and helping them have the best Preschool experience possible. Hello! My name is Emmalee Lowis. I have been teaching at TotSpot Preschool since the Fall of 2011. I absolutely love the atmosphere and the fun of teaching children! I believe that the first few years of a child’s life are so crucial to their development and I feel privileged to be able to help children reach their full potential. My love for teaching has given me many opportunities and adventures recently and I feel so very blessed. In the summer of 2012 I traveled to India to volunteer for a leprosy colony. I participated in medical procedures, aided in the construction of housing, and taught children in their own schools. It was such a rewarding experience! Upon returning home, I met my husband and after being married for only a few months, decided to travel to Russia. We spent our time there as English Teachers teaching kindergartners. We lived there for 5 months and had many amazing experiences. With my teaching experience in India and Russia, I feel especially prepared to teach children from all different backgrounds, whether their native language is English or not. I am grateful that TotSpot is a part of my life! I find joy in children’s discoveries and watching them learn and grow. That alone is a great reward. Hello! I’m Amanda Richards and I’m so excited to be a part of TotSpot Preschool! I have lived in Arizona for 25 years but I’m originally from Michigan. I currently live in Gilbert with my husband, Steve and our two kids, Tyler age 7 and Teagan age 5. Both of my kids attended preschool at TotSpot and our family has been a part of this fantastic preschool for the last four years! For the past seven years I have enjoyed being a stay at home mom and taking care of my wonderful kids. Before having kids I was a teacher for six years. During that time I taught preschool and kindergarten in a private school in the valley. I have always loved working with and being around young children. I am thrilled to be back in a classroom and feel very blessed to be working with such an amazing group of teachers, staff, parents, and kids. I look forward to watching your little ones learn and grow this year! Hi my name is Laura Shields. I am a native Arizonan and have lived here most my life. I have recently developed a new appreciation for the desert after living in New Zealand for 2 years. While it was a thrilling and edifying experience, my family and I are happy to be home. My husband and I have three lovely daughters and a super son. Before having our 4 amazing children, I graduated from UofA with a degree in Wildlife Biology, and worked at the Phoenix Zoo as a keeper. I was a substitute teacher for Mesa School District and also worked in a child care facility. Before my son was born, I was providing in-home child care for a couple families. My talents lie in the nurturing field, whether with animals in the zoo, with my own kiddos, or with yours. It is what I love, and where I want to focus my career. I look forward to working with your little gems.